Last night was the biggest night of the month on Adda52.com as their flagship monthly tournament called The Rich Race took place. 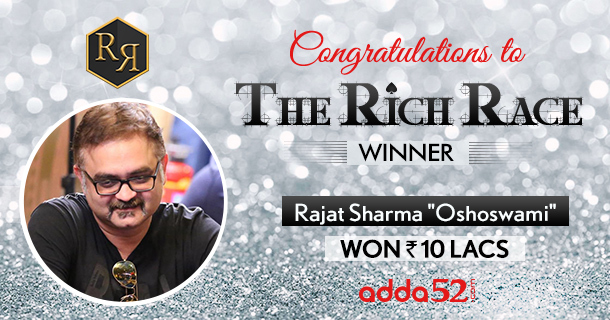 The event attracted a total of 676 entries and it was the well-known face from the poker circuit and a passionate poker player in Rajat ‘Oshoswami’ Sharma from Gurgaon who took down the title after defeating Navin ‘urfish’ Gopi in heads-up play. Rajat took home INR 10 Lacs and Navin settled for 4.12 Lacs. The Rich Race tournament wrapped up in the morning 3:04 AM with blinds running 70000-140000 with an ante of 25000 when Rajat ‘oshoswami’ Sharma in the small blind moved all-in with Ac-Kc and Navin ‘urfish’ Gopi holding Ks-4d made the call from the big blind. The board ran out 7d-3h-4c-Ah-9d, giving Rajat a top pair of Aces to win the title. 1. First of all, congratulations on winning The Rich Race! For our readers who don’t know much about you, please introduce yourself and tell us about your poker journey? Rajat- I am a private banker by profession. Have been playing some “serious recreational” poker for the last 2-3 years. 2.Coming back to The Rich Race, how does it feel after winning such a prestigious tourney? Rajat- Obviously, it feels good winning any tournament because of the long grind that one puts in. This one was special because its my highest pay day till date, specially when you have been on some down swing for the last 3-4 months. In fact, I had finished 2nd in the March or April edition of Rich Race and now it feels good to close it out finally. 3.Please share your key hands and turning points in this tournament? Rajat- Throughout the tournament I don’t think I was ever in the danger zone. I played quite well made 1 big lay down on the FT preflop. If I tell you what it was, people who know how I play will never believe me ha ha ha. I was lucky throughout in the sense that whenever I got it in, my hands held & yes I won all the flips except 1 spot where i had a 3 way all in preflop holding KKs vs QQs vs JJs & I got out flopped. Except this hand it was more or less a smooth ride with very few bumps. But what I also want to add is that the structure of the tournament was not that great & as discussed with some of the team members of Adda 52 its gonna be revamped completely in a week or two. That’s good news & I definitely look forward to it. 4.You beat Navin ‘urfish’ Gopi in heads-up. Could you describe your heads up game play? Rajat- It was a very short heads up battle but I think Navin played very well. In fact, every one on the Final Table (FT) played really well. I was talking to Pranay Kapoor who was also in the final 9 & we were discussing it would be fun if we enter heads up. 5.How much poker do you play on an average? Rajat- Honestly not much of late. I stick to a few hours of Cash PLO on PokerStars and small and micro stakes, and that’s about it. Except Sundays where I do put in a tourney grind playing almost everything on all major Indian poker sites & select few on PokerStars. 6.What do you do to improve your game? 7. Whom do you idealize in poker, both in India and internationally? Rajat- Idolizing would be a very strong word but I admire a lot of Indian pros for clarity in their thoughts & execution of their ideas and strategies on the felt. Danish & Antilog for me stand out. A big shout out to Aditya Sushant as well, for bringing the 1st WSOP bracelet to India. Take a bow Sushi. Internationally I am a big fan of Daniel Coleman, Ike Haxton & Ben Sulsky. 8.If you could have one poker mentor from India, who would it be and why? Rajat- Ha ha. Haven’t thought of mentors as such but I would definitely like to pick brains of all Top Pros & learn as much as I could about this wonderful game called Poker. 9.Finally, what is your one poker dream you would like achieve in 2017? Rajat- Keep winning J. Thanks a lot & see you folks at DPT in July. Cheers!